We are living in a Digital Age. A robust Digital Transformation Strategy is today’s organization’s corporate http://flevy.com/blog/wp-content/uploads/2018/11/People-Ecosystem-pic1-768x365.jpg 768w, http://flevy.com/blog/wp-content/uploads/2018/11/People-Ecosystem-pic1.jpg 892w" sizes="(max-width: 359px) 100vw, 359px">armaments in remaining competitive. In this article, let us focus on our people, the People Ecosystem. 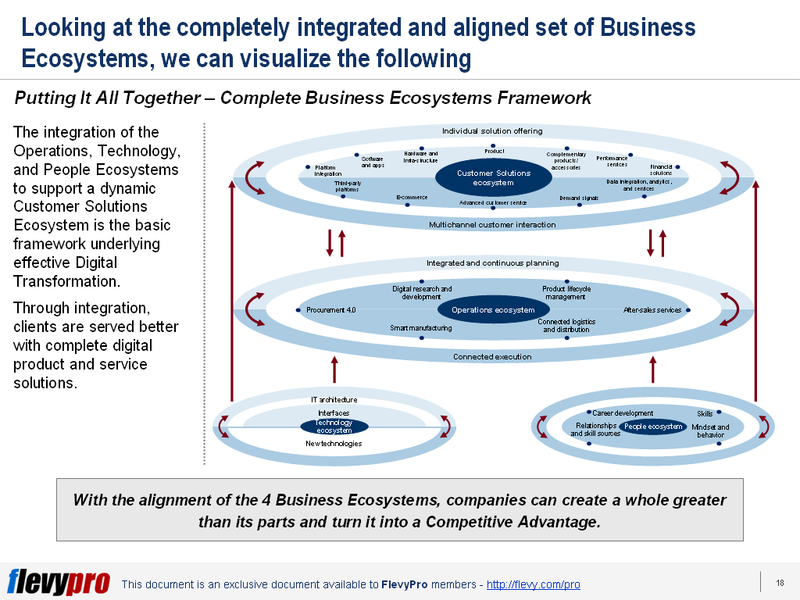 The People Ecosystem supporting Digital Transformation can be considered the most critical of the 4 Business Ecosystems. Its role is to enable and support the efforts of the other 3 ecosystems. An effective and well-designed People Ecosystem is core to a company becoming a Digital Champion. The People Ecosystem is the domain of organizational Core Competencies and Corporate Culture. As an enabling layer, it supports Digital Transformation. Only companies with a clear digital vision, strategy, and culture to support Digital Transformation can take advantage of the People Ecosystem. To achieve this, it is necessary to heavily invest on training and developing the right skills. Yet, 2/3 of the companies today lack this vision. A dynamic and robust People Ecosystem will enable companies to effectively respond to consumer demand. When companies achieve a successfully Digital Culture, Digital Leaders can expect to harvest its greatest benefits. Strong capabilities in data analytics, human machine interaction, and technology supported decision making are achieved. A non-hierarchical “best idea counts” mentality exists that leads to rapid decision making and problem-solving orientation. There is internal and external integration that creates dynamic cross-functional teams. A progressive career development is in placed that motivates and rewards innovation. What does the future holds? By 2023, it is expected that digitization and automation will drive down operation costs in mature market. Low cost in operations will strengthen capacities of companies to compete. Likewise, reshoring and increasing production in home markets are expected in the next 5 years. With all the digitization and automation that is expected to occur, it is expected that employees will be greatly affected. Digital Champions that have learned to his will greatly affect workers and he kind of employee companies hire. Interested in gaining more understanding on People Ecosystem? You can learn more and download an editable PowerPoint about the People Ecosystem Layer of Digital Transformation here on the Flevy documents marketplace.